Everyone has a Tetrimino they really love, right? It's okay, we won't tell anyone. When you're playing a round of Tetris, there's that one Tetrimino you're always waiting to have fall down into the Matrix. One you have to grab for your Hold Queue no matter what. It's the one you do your most damage with, and will always be around to get you out of a tight spot. For me, without a doubt, my favorite Tetrimino is the I-Tetrimino. It's been like that pretty much since I started playing Tetris. Truth be told, I play a bit of a risky game of Tetris, and it's all centered around the I-Tetrimino. My entire game is shaped by it. All the other Tetriminos are playing the supporting role to my favorite! When I play Tetris, I am always going for a big clear. I like to clear out four lines for a Tetris Line Clear whenever I can. This goes for both solo play and when I'm going up against real-life competitors. Depending on what other Tetriminos I see slotted to fall into the Matrix, I'll pick the left or right-hand side to place my I-Tetrimino. I won't put it up against the actual wall of the Matrix, though. I'll bring it in by a single column, so it's only one column away from the Matrix wall. This gives me the perfect spot to line up another I-Tetrimino for a big clear later on. With my first I-Tetrimino in place, I'm free to take all the other Tetriminos and fill in the rest of the empty space. Usually I can manage to completely fill in the large space next to my I-Tetrimino completely. When I do that, I know I'm set for a Tetris Line Clear! When the next I-Tetrimino comes in, I immediately Hard Drop it into the small space I've left next to the already-placed I-Tetrimino. Watching it lock into the available spot I left for it is so satisfying! I've spent all this time building up the perfect Tetris Line Clear, and the I-Tetrimino is both the starting point, and the end point for the big score. There’s nothing more satisfying than locking the I-Tetrimino in place. I play the exact same way when in a multiplayer situation. I build up the Matrix in the same manner, and sometimes I even double up! I'll make my Matrix 8-lines high instead of 4, then slam down two I-Tetriminos for a back-to-back Tetris Line Clear! This sends an insane amount of garbage to your competitor, and depending on how they were doing before, this could be more than enough to have them topple over the top of the Matrix. When I have an I-Tetrimino waiting in the Hold Queue, I always feel a bit better. It's like my safety blanket for bad things to come. If I start to get in a bit of trouble, I can always pull the I-Tetrimino out of the Hold Queue and get things back on track. Put any other Tetrimino in the Hold Queue, and I instantly feel nervous! Which Tetrimino do you like the most? Are you an I-Tetrimino fan like myself, or does another Tetrimino have your heart? No matter which one you hold near and dear, they're all extremely important stepping stones to making things work. So, why not play Tetris right now and see which Tetrimino ends up being your favorite? 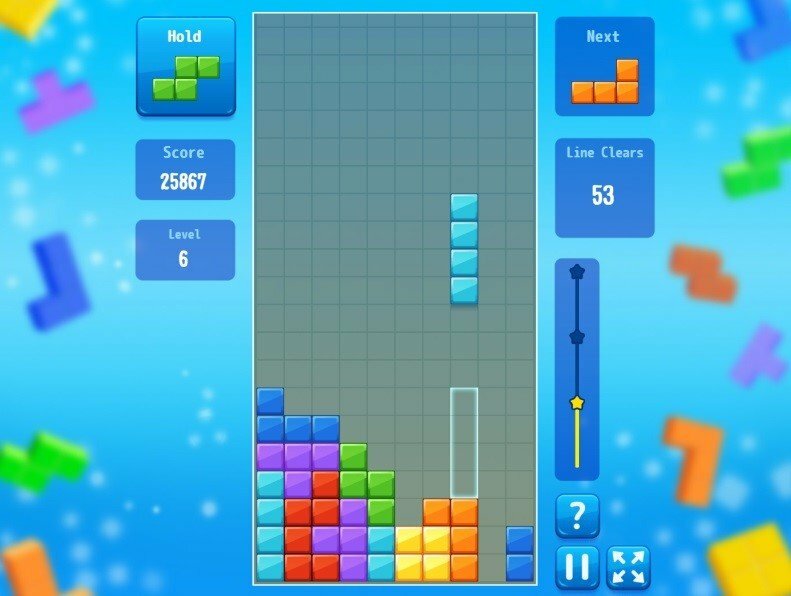 You can play for free at Tetris.com right now!